Rightfully, beautiful women resent being judged on their looks alone. The Shanling T-100 has suffered similar disrespect. In certain Internet cases, this has even prompted the equivalent of tasteless and adolescent dumb blonde jokes. Being Chinese has only compounded this further - as though world-class industrial design, Far-Eastern origins and reference caliber performance couldn't possible coexist. Racism. Audio misogyny. Harsh preconceptions. Not exactly reactions that inspire audiophile brotherhood, curiosity or open-mindedness. Thankfully all it takes is listening; not to preconceptions and uneducated judgments but the real thing - the actual player. Even in the presence of acknowledged bleeding-edge greatness, this Shanling doesn't wither. 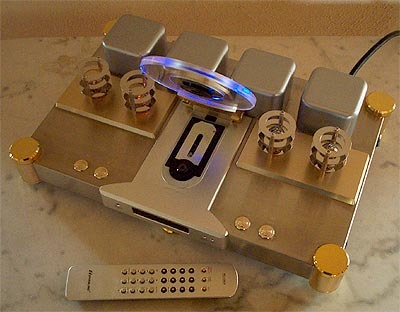 The Zanden Model 5000 MKII DAC -- whose owners on record mention it in the same breath as the Lindemann SACD player and dCS gear -- is one bona fide yard stick for true state-of-the-art RedBook playback. Its designer Kazutoshi Yamada and international sales manager Hideo Kitazawa showed this working-class writer unbelievable kindness when informed that, in the wake of its recent review, their vaunted valved DAC was ready to return to Osaka-City/Japan. "You clearly love music. We want you to keep it as your reviewer's reference." 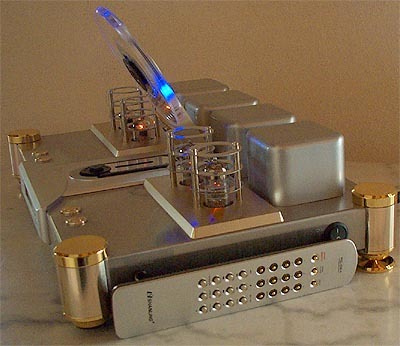 With 6N3 tube and transistor-powered outputs; separately valved headphone socket; bare-head Philips 1201 top-loader; Pacific Microsonics PMD-200 digital filter, Crystal's 8420 sample-rate converter chip and four Burr-Brown PCM 1704 DACs; defeatable 24/96 upsampling; 0 to 100 digital-domain remote-controlled volume that adjusts both mains and headphone outputs in parallel; 3-stage display dimming; your choice of soft or pointy feet with spike protectors; included white handling gloves, a twin test CD and custom power cord, with packaging every bit as sophisticated and professional as the unit's looks - the Shanling T-100, make no mistake, is one all-'round class act of the highest order. 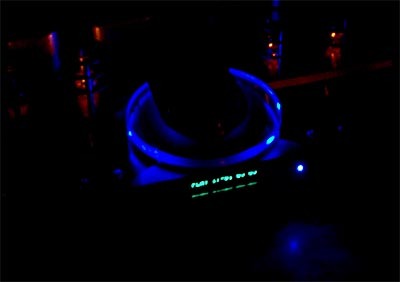 Three blue diodes embedded in the hinge of the acrylic cover, especially at night, make for a very tasty light show. 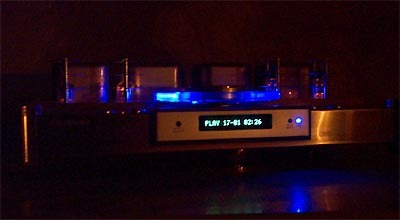 Orange tube glow reflects off the stainless steel cover to mingle with the dark blue rays spilling from the central orb, itself set off against the cyan display. The gold accents on the integral pillars, the tube rails' and lid hinge's champagne trim add more visual charm. The nomenclature's engraved rather than silkscreened to spell design detail in yet bigger letters. This theme of obsessive industrial design execution continues on the unit's right side. It houses a frontal headphone socket and rear power switch to keep the fascia free of clutter. You know how much gear places its power switch (or even the headphone socket) on the rear panel where you can't conveniently get to either? The back accommodates the IEC power inlet and five deluxe CMC US-made RCA sockets that look for all the world like top-line WBTs - transistor and tube analog outputs, one coaxial digital output at either 16/44 or 24/96 depending on whether upsampling is engaged or not. The two blue LEDs to the right of the display indicate 24/96 or HDCD detection respectively, the duos of push buttons flanking the self-clamping lid control play/pause and stop to the left, previous and next track to the right. The tube covers don't dismount though the top ring can be unscrewed. Rather, you wiggle the valves out from in-between the thin steel rings. The champagne/gold theme continues with the RC-02A remote that offers the usual direct track access; 24/96 engage/defeat; scan, repeat1/all, random and programming; display brightness; and volume up/down and mute. Its effective infrared coverage beam is laterally narrower than others, hence a closer on-axis perspective is required to securely prompt commands. The transport lid is manual and outfitted with a self-centering puck. The moment the cover is closed, the laser automatically reads the TOC. That's a 4-second process. To cue up track 8 on a 17-track CD took 8 seconds. 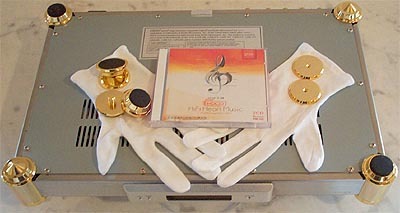 Depending on the flatness of a CD loaded, the initial mild whirring noise either abated entirely for inaudible spinning or continued to be audible up to 3 feet away. If upsampling is defeated, the HDCD indicator lights up during the initial TOC scan but then extinguishes unless the CD is HDCD encoded. At 27 lbs and 17,5" W x 11.5" D x 4.5" H, the T-100 requires 9 inches of total clearance for the lid to fully open and stay open by itself. The Parts ConneXion mod involves replacement of the stock 6N3 main (not headphone) output pair with Western Electric 396As. 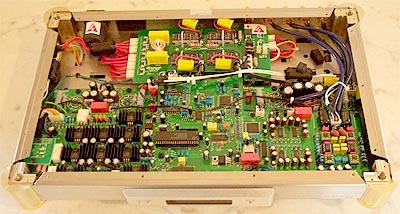 It also upgrades the four stock OPA 2604s to proprietary OPA 627 adaptor pcbs. 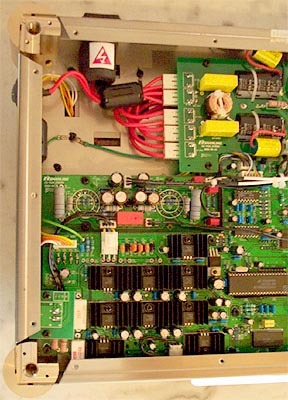 In the power supply, the mod entails 9 ultra-fast, soft recovery Hexfred International Rectifier and Fred Vishay-Telefunken diodes; 2 Black Gate electrolytic capacitors and 4 Auricap metalized polypropylene bypass capacitors. For the valved output stage? 18 Audio Note Tantalum 0.5 and 1 watt resistors in the signal path; 4 Black Gate standard-grade electrolytic output coupling capacitors and 2 Auricap metalized polypropylene coupling bypass capacitors. For the solid-state direct stage? 14 Riken Ohm Japanese 0.5-watt, gold-lead carbon resistors in the signal path; 4 Black Gate standard-grade electrolytic output coupling caps; 6 Burr Brown high-performance, audio-grade dual OPA 2134 op amps. Additionally, the Parts ConneXion installs 4 feet of Cardas coaxial 21 awg shielded output wire; 2 sheets of Soundcoat dampening for the internal chassis; and TRT silver-content wonder solder for all modification joints. This mod takes 7 hours to perform and upholds the 12-month factory warranty. As with the already reviewed Jolida JD-100 and Music Hall CD-25, this modified Shanling T-100 is a special Graham Company exclusive with the Parts ConneXion. Atlanta-based, it sells completely modified, brand-new units for $2,690 plus shipping. Or, it arranges for retroactively installed mods at $1,200. 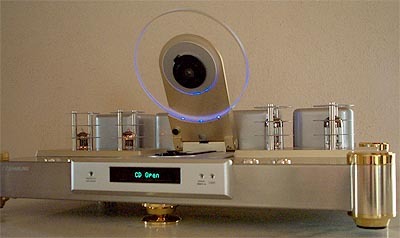 Since the stock T-100 retails for $1,995 through Music Hall, acquiring an already-modded player through the Graham Company equals a $500 savings over contacting Graham's Walter Liederman for this particular upgrade at a later time. 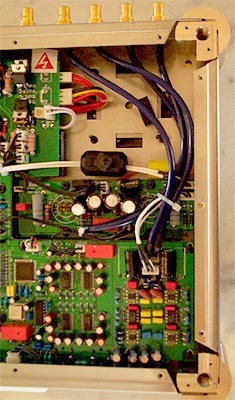 Some easily seen modification changes are the big yellow Auricap bypass caps in the upper central sector; the resistor upgrades around the four upright silver-bottom storage caps in the middle right; the four OPA627 adaptor pcbs around the six yellow lateral caps in the lower right-hand corner; the six OPA 2134 chips divided by heat sinks in the lower left-hand corner; the output hookup wire in the upper right-hand corner. But enough window shopping already. How well does this machine carve the digital tracks?